is a powerful protector against negative energies that cause you to feel drained throughout the day. It is a stone that keeps you grounded while transmuting heavy, dense energies into that of a lighter vibration which will suit you better so that you may manifest your goals with focused intent. 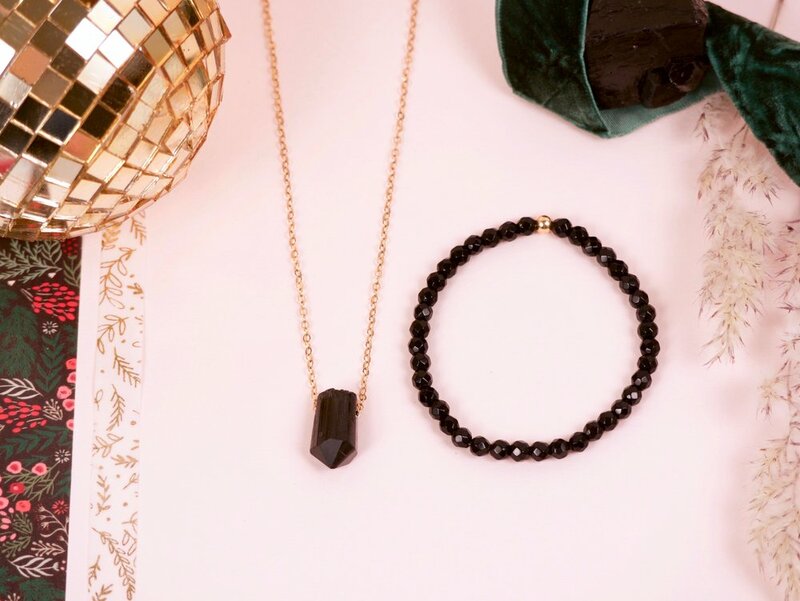 Black Tourmaline acts like a bad-vibe vacuum, detoxifying your energetic and physical body while creating a harmonious balance to all chakras and leveling out masculine and feminine energies. It encourages a mindset which embraces vulnerability to better understand yourself and those around you, releasing negative thought patterns, eliminating fear and victimization modalities. Black Tourmaline draws in a positive attitude, attracting compassion, inspiration, tolerance and prosperity. embodies total unconditional love, allowing you to cultivate gratitude and embrace self-love for how uniquely perfect you are. Known popularly for its powerful ability to heal, Kunzite carries you into a meditational state with ease and encourages clarity and focus through deep presence and self-awareness. Rejects negativity, panic, fear and stress, allowing a protective energy to embrace your aura, lending guidance through transitions and challenging life adjustments. This stone is a powerful healer for those with heavy or suppressed memories, helping to free your heart from blockages that no longer need to be carried and should be processed and released. Focused intently on Universal and Divine love, Kunzite urges you to reclaim trust and enthusiasm, opening your heart to abundant love of self and for all that surrounds you. I love layering and matching my magic, and my W&W collection is always expanding while encouraging me to balance my energies and bring extra power to my vibration. I am so thrilled and honored to share this collaboration with you, as they are just as dreamy as they are durable and perfect for gifting yourself or your loved ones for the holidays. There are three sets offered: GARNET, AQUAMARINE and BLACK TOURMALINE - limited quantities available, get them while they last! is an aromatically sweet Holy Wood from South America, with notes of lemon, pine and mint, its sacred smoke long utilized for cleansing negative or stagnant energy from your environment, auric field, or any energetic residue which can get trapped inside of your stones. Hold the Palo Santo over a lit flame for 30-40 seconds, blowing out the flame and using the smoke to go over your necklace and throughout your sacred space, mindfully releasing any energies that no longer serve you and pulling in that which you choose to welcome instead. Recommended to burn as often as you feel inclined, from once daily, weekly or any time that feels stressful or chaotic and needing a good smudge. Palo Santo is traditionally beneficial for prosperity, good luck and abundance, replacing dense, heavy energies with a positive, fresh slate. *all orders placed through December 25 will receive a complimentary Palo Santo as a gift with purchase.